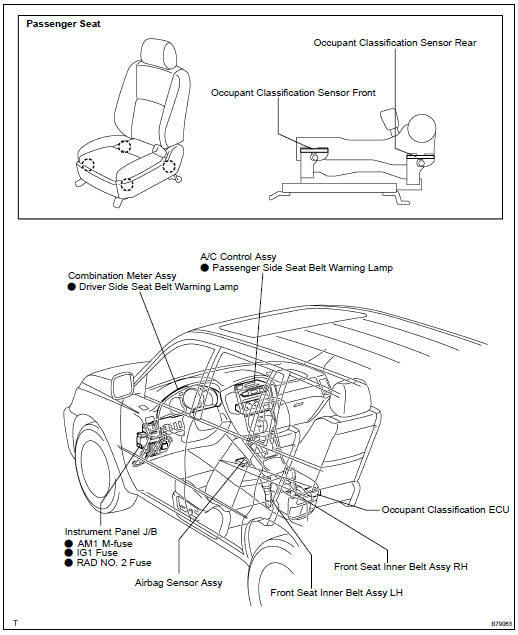 NOTICE: The front seat inner belt RH and LH cannot be inspected. When the front seat inner belt seems to be malfunctioning, use the hand-held tester to check for DTCs. HINT: The seat belt warning system is part of the large-scale multiplex communication system. This system features shared communication wiring that reduces the wiring complexity of the communication lines. The first step in any repair is to confirm the proper operation of the communication system. Proceed with troubleshooting after the communication has been verified (see multiplex communication system).